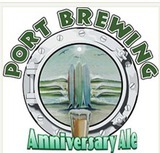 A massively hopped strong pale ale brewed to celebrate our anniversary each year. Anniversary Ale is light gold to pale orange in color and offers a potent aroma of fresh pine and citrus with some warming alcohols present. The taste is a thick, chewy hop presence only barely contained by balancing malts. The finish is pure hop expression with a moderate warming alcohol sensation.